If you're stuggling with the scale of this, here are the players: In the first tier, Yahia Al-Shehri signed for Leganés and Marwan Othmnan for the B team, Fahad Al-Muwallad signed for Levante, Salem Al Dawsari for Villarreal and Jaber Issa signed for the B team. In the second tier, Nooh Al Mousa signed for Valladolid, Abdulmajeed Al Sulayhim for Rayo Vallecano, Ali Al Namer for Numancia and juvenil Abdullah Al Hamdan signed for Sporting de Gijón - but is largely expected to play for the B team. All these players are on loan for six months, with no guarantees of playing time, ahead of next summer’s World Cup. Did I mention that the league signed the players? Obviously the big teams were exempt, and the small teams took the offer. Because of course they did - a small financial reward, reportedly between 1 and 5 million euros depending on the player, and not having to pay a transfer fee or wages for a player, is irresistible. 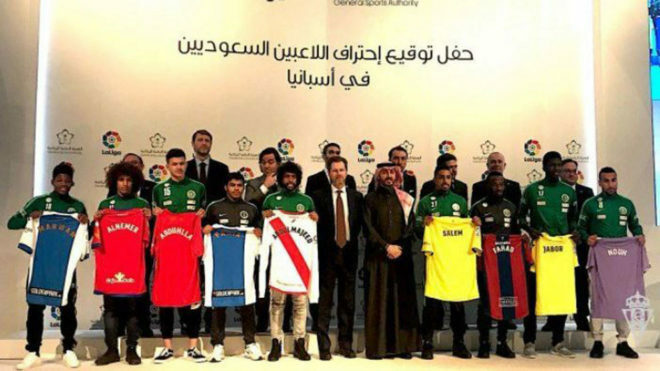 If you follow Middle Eastern politics, and you had the tingling suspicion that new Saudi Crown Prince MBS (ok, Mohamed Bin Salman) was behind this, you guessed right - he owns a stake in La Liga. But I'm sure that's a coincidence. And to be fair, there are also agreements in place for these same clubs to open academies in Saudi Arabia and use Spanish coaches - but why do players, who are unlikely to play at these clubs, have to be involved in this deal? And the league does say that the clubs got to pick the players, but that the Saudi clubs involved had the final say. And what about the coaches? Well, Levante, who desperately need a striker, don't need midfielder Fahad Al-Muwallad since they already have many of them. Most damning of all is the signing of Yahia Al-Shehri. The 27-year-old, hardly a young prospect, takes up the last squad spot available at Leganés. The current head coach, Asier Garitano, didn’t want the player and this is putting his long-term future at the club in doubt. Levante's Juan Muñiz didn't either. Villarreal have a history of accepting foreign players in their squad. They’ve had experience with Middle Eastern players being signed before for business purposes. Akram Afif signed from the Aspire Academy, which also has had multiple player deals with Cultural Leonesa, and is now on loan at Belgian side Eupen. But you could even forgive that, because Akram previously played at Sevilla and learnt Spanish. How are these nine players supposed to adapt? Why are the club managers getting the say and not the managers? The problem is, this is just the start. It's being reported that La Liga intends to do this again. Because of course they do. But nevertheless, when it comes to Rayo, I'm not proud. Not just because this happened, but because this has happened before, with Qbao and Zhang Chengdong (which I talked about yesterday). So what will happen? Clubs will abandon signing players until the summer, which will have sporting consequences. Academies will suffer and hopes will be dashed. All for what? Brand exposure? Money?